Thank you for your interest in volunteering for the Los Angeles Times Festival of Books. The Festival of Books began in 1996 with a simple goal: Bring together the people who create books and the people who love to read them. It has since become one of the country's largest and more eagerly awaited literary events. Over 150,000 people attend the Festival each year, which features more than a hundred ticketed author events, children’s storytelling, poetry readings, book signings and more than 400 exhibitor booths. The Festival’s success has been due in part to the generous participation of volunteers who welcome attendees, assist with registration, staff author events, supervise book signings and much more. The 2019 Festival will be held on Saturday, April 13 and Sunday, April 14 at the University of Southern California and we would love to have you join us as a volunteer. Volunteers must be 18 years of age or older. We will accept volunteers aged 15-17 if they are volunteering alongside their parent or guardian. Volunteers cannot have children under the age of 15 with them during their shift. The majority of volunteer activities require being on your feet for most of your shift. Please wear comfortable shoes. Volunteer shifts last 3 - 4 hours, and you may sign up for as many shifts as you wish for one or both days. You may sign up for overlapping shifts and work the duration of the hours for those shifts. Volunteers will receive free parking, shuttle service from the parking lot, and lunch. Volunteers will receive a T-shirt to wear and keep after the event. Volunteers are asked to wear khaki or beige pants or shorts. Most volunteer positions are assigned when you check-in on the day of event. There are a few assignments with special time requirements (author escorts, registration, etc.) that you can express interest in as part of the online registration process. Pre-registered volunteers have been sent maps, parking passes and iniformation about orientation via email. These were sent out the last week in March or the day after you registered online after that. If you've pre-registered and not yet received this information - please email us at festivalofbooks@troutco.com. NOTE: Pre-Registration is now closed: The deadline for pre-registering as a volunteer online was April 10th, and at this time we can no longer pre-register volunteers. It's inevitable however, that there will be cancellations and no-shows and so we welcome "walk-in" volunteers who wish to register on the day of the event! On either Saturday, April 13 or Sunday April 14, please come in and register onsite at the event Volunteer Center located on the 2nd floor of the USC Hotel at 3450 S. Figueroa Street (just across Figueroa from USC). We welcome walk-in volunteers between 11:30 a.m. and 2:45 p.m.on Saturday, or from 9 am - 2:30 pm on Sunday. We will register you, give you a t-shirt, lunch and an assignment. Our greatest needs are for Saturday afternoon and any time onSunday. So please don't hesitate to walk-in and offer to volunteer! If you have already registered and find you are unable to attend and must cancel as a volunteer, please email us as far in advance as possible. Looking forward to seeing you this year at the Festival of Books! 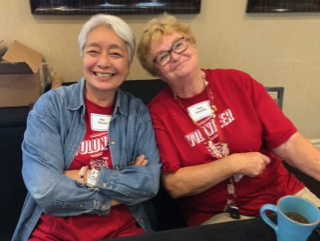 (If you aren't able to volunteer this year - please join the Festival of Books Volunteer email list by clicking on the link below to be notified of future opportunities). Click here to go to the Los Angeles Times Festival of Books webpage.